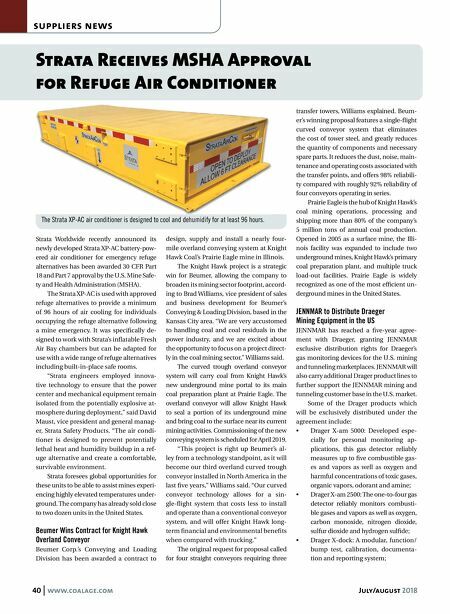 40 www.coalage.com July/august 2018 suppliers news Strata Receives MSHA Approval for Refuge Air Conditioner Strata Worldwide recently announced its newly developed Strata XP-AC battery-pow- ered air conditioner for emergency refuge alternatives has been awarded 30 CFR Part 18 and Part 7 approval by the U.S. Mine Safe- ty and Health Administration (MSHA). The Strata XP-AC is used with approved refuge alternatives to provide a minimum of 96 hours of air cooling for individuals occupying the refuge alternative following a mine emergency. It was specifically de- signed to work with Strata's inflatable Fresh Air Bay chambers but can be adapted for use with a wide range of refuge alternatives including built-in-place safe rooms. 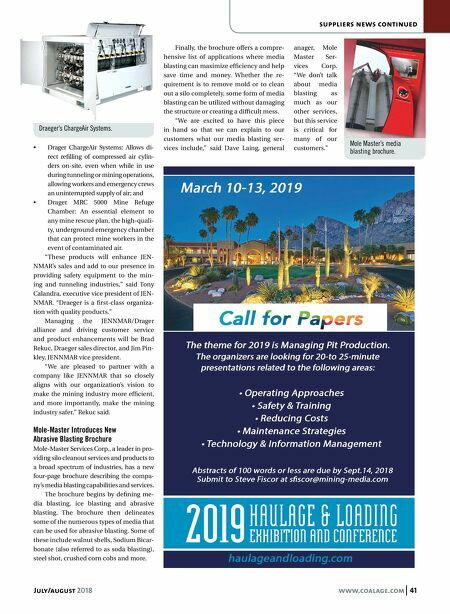 "Strata engineers employed innova- tive technology to ensure that the power center and mechanical equipment remain isolated from the potentially explosive at- mosphere during deployment," said David Maust, vice president and general manag- er, Strata Safety Products. "The air condi- tioner is designed to prevent potentially lethal heat and humidity buildup in a ref- uge alternative and create a comfortable, survivable environment. Strata foresees global opportunities for these units to be able to assist mines experi- encing highly elevated temperatures under- ground. The company has already sold close to two dozen units in the United States. Beumer Wins Contract for Knight Hawk Overland Conveyor Beumer Corp.'s Conveying and Loading Division has been awarded a contract to design, supply and install a nearly four- mile overland conveying system at Knight Hawk Coal's Prairie Eagle mine in Illinois. The Knight Hawk project is a strategic win for Beumer, allowing the company to broaden its mining sector footprint, accord- ing to Brad Williams, vice president of sales and business development for Beumer's Conveying & Loading Division, based in the Kansas City area. "We are very accustomed to handling coal and coal residuals in the power industry, and we are excited about the opportunity to focus on a project direct- ly in the coal mining sector," Williams said. The curved trough overland conveyor system will carry coal from Knight Hawk's new underground mine portal to its main coal preparation plant at Prairie Eagle. The overland conveyor will allow Knight Hawk to seal a portion of its underground mine and bring coal to the surface near its current mining activities. Commissioning of the new conveying system is scheduled for April 2019. "This project is right up Beumer's al- ley from a technology standpoint, as it will become our third overland curved trough conveyor installed in North America in the last five years," Williams said. "Our curved conveyor technology allows for a sin- gle-flight system that costs less to install and operate than a conventional conveyor system, and will offer Knight Hawk long- term financial and environmental benefits when compared with trucking." The original request for proposal called for four straight conveyors requiring three transfer towers, Williams explained. Beum- er's winning proposal features a single-flight curved conveyor system that eliminates the cost of tower steel, and greatly reduces the quantity of components and necessary spare parts. It reduces the dust, noise, main- tenance and operating costs associated with the transfer points, and offers 98% reliabili- ty compared with roughly 92% reliability of four conveyors operating in series. Prairie Eagle is the hub of Knight Hawk's coal mining operations, processing and shipping more than 80% of the company's 5 million tons of annual coal production. Opened in 2005 as a surface mine, the Illi- nois facility was expanded to include two underground mines, Knight Hawk's primary coal preparation plant, and multiple truck load-out facilities. Prairie Eagle is widely recognized as one of the most efficient un- derground mines in the United States. JENNMAR to Distribute Draeger Mining Equipment in the US JENNMAR has reached a five-year agree- ment with Draeger, granting JENNMAR exclusive distribution rights for Draeger's gas monitoring devices for the U.S. mining and tunneling marketplaces. JENNMAR will also carry additional Drager product lines to further support the JENNMAR mining and tunneling customer base in the U.S. market. Some of the Drager products which will be exclusively distributed under the agreement include: • Drager X-am 5000: Developed espe- cially for personal monitoring ap- plications, this gas detector reliably measures up to five combustible gas- es and vapors as well as oxygen and harmful concentrations of toxic gases, organic vapors, odorant and amine; • Drager X-am 2500: The one-to-four gas detector reliably monitors combusti- ble gases and vapors as well as oxygen, carbon monoxide, nitrogen dioxide, sulfur dioxide and hydrogen sulfide; • Drager X-dock: A modular, function/ bump test, calibration, documenta- tion and reporting system; The Strata XP-AC air conditioner is designed to cool and dehumidify for at least 96 hours.